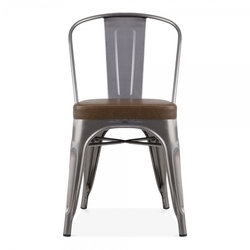 We are a leading Manufacturer of industrial cafe chair, industrial chair/cafeteria chair/chair and stools/industrial chairs, metal-bar-stool with wooden-tractor-seat-(copper finish),adjustable height bar stool, industrial metal arm chair with wooden seat/industrial chair, industrial stool, vintage industrial toledo stool gunmetal and industrial dinning stool, leather seated cafe stool from Jodhpur, India. 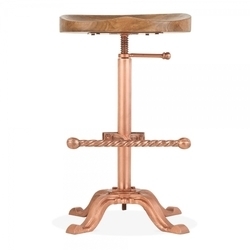 Realise your dream vintage look with this Bazzar adjustable tractor seat stool in metal and mango wood with a gold finish, ideal from kitchens to bars and restaurants. 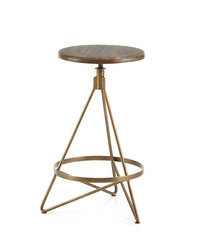 This charming counter stool comes with a gold-finished base and is fully adjustable to provide a range of heights for your guests. 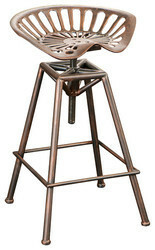 It is also available in a black metal or copper metal finish. This item is artisan crafted with meticulous care. Given its handmade and hand-finished nature, variations in the metal work are to be expected and celebrated. Each item is unique and no two are exactly alike. 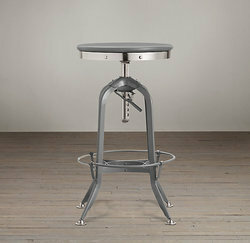 Recycled industrial vintage furniture focuses on the use of wood and materials reclaimed from workshops and factories. Whether you’re going for an armchair, antique coffee table or a glass cabinet, you can get all them from industrial vintage furniture. Such type of furniture is unique and forges a sense of elegance and style to a room. It also adds a bit of completeness and sophistication especially when such furniture perfectly complements the interior of your home. While vintage furniture is considered to be the ‘in’ thing these days. While the gear is always towards modernization, there’s always a niche clientele who prefer vintage industrial furniture items. 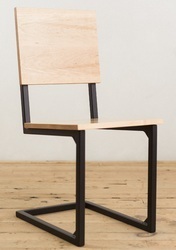 If for them that we make limited editions of such furniture with ingredients sourced from workshops and old factories. Preserving History with Industrial Vintage FurnitureFurniture designing is constantly changing for staying abreast of the latest trends that emerge in the market in every year. Designs can vary from traditional to contemporary. 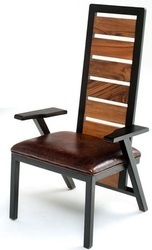 The latest of furniture designing incorporates sustainable or green furniture materials. While many furniture pieces that we see these days incorporate recycled materials, industrial vintage furniture has begun to appear in the scene. We have largely begun to incorporate antique and vintage artifacts in many of our new creations. This means production of limited edition furniture that many assembly line furniture manufacturers fail to manufacture. Our designers pursue an artistic approach to their craft and hence we can serve our clientele in the best way with our vintage industrial furniture that can hardly be found in any typical furniture. 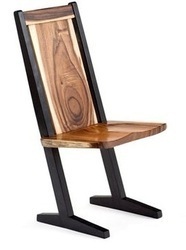 Recycled industrial vintage furniture focuses on the use of wood and materials reclaimed from workshops and factories. Whether you’re going for an armchair, antique coffee table or a glass cabinet, you can get all them from industrial vintage furniture. Such type of furniture is unique and forges a sense of elegance and style to a room. It also adds a bit of completeness and sophistication especially when such furniture perfectly complements the interior of your home. While vintage furniture is considered to be the ‘in’ thing these days. While the gear is always towards modernization, there’s always a niche clientele who prefer vintage industrial furniture items. If for them that we make limited editions of such furniture with ingredients sourced from workshops and old factories. 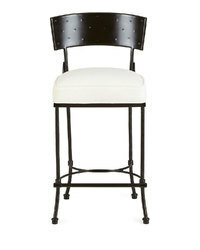 Sophisticated and traditionally styled, these classic bar stools could add a touch of elegance to any interior. Their curved steel frames have been distressed to give them a beautifully aged appearance; a footrest has also been incorporated for added comfort. The polished seats are crafted from oak and they have a rich, warm colouring. The pattern of the wood differs slightly from item to item, which adds further character to the stools. 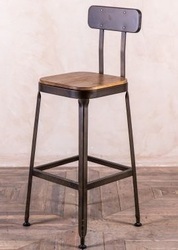 Great for commercial environments, these bistro stools would work wonderfully as traditional bar seating. 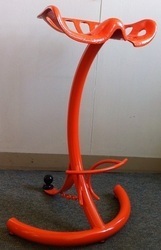 They would also look brilliant in vintage or French inspired bistros and cafes at poseur tables or bar areas. Packaging Details: As our per customer requirement. 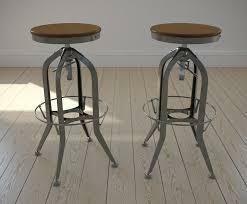 These industrial look bar stools are a fantastic example of vintage inspired restaurant furniture. 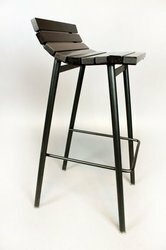 A great take on a classic tall bar stool, the gunmetal coloured ‘Acton’ stool has a backrest and is available with either a wooden or black upholstered seat, for added style and comfort. It is also possible to remove the black seat pads and have them reupholstered in a different colour, if required. 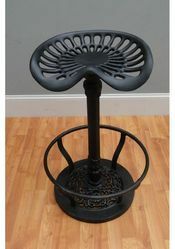 Suitable for a bar, coffee shop or restaurant, this stool could be paired with some of our bar tables, chairs or lights to complete any industrial style interior. 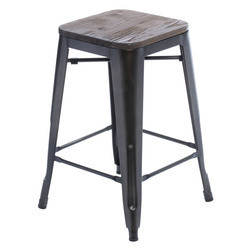 These stools have a slightly distressed appearance; this is caused by the manufacturing process and adds to the industrial appearance of the stools. Informed by simple prairie modern architecture, kraft tree School/House Chair is plotted at the intersection of elegance and function. Beautiful, clean-lined, and durable, the dining-size chair pairs harmoniously with nearly any table style and material. Plus, it’s incredibly comfortable. The steel frame is cut and welded by hand from 1-inch steel tube. The steel is available powder-coated in raw steel or any of our nine color options . Silver and bronze options are shown in these photos. Learn more about our high-quality powder-coating process. These simple, attractive vintage counter stools from Taboret are an ideal solution for creating extra seating space for family or guests. 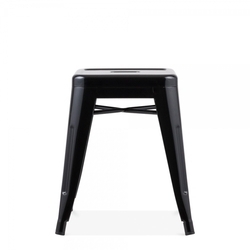 The backless counter stools can be stored underneath the counter or stacked into a corner or closet when not in use. 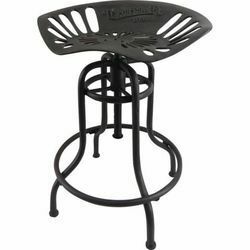 Featuring wood seats and metal frame construction, the stools are also durable and easy to clean. 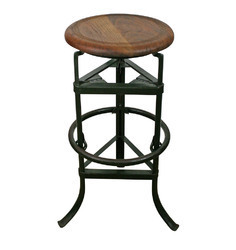 Complete your traditional or industrial style decor with these simple counter stools. 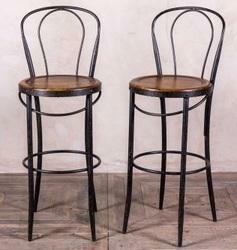 This matching set of two stools is made of durable steel and wood that withstands regular use without damage. 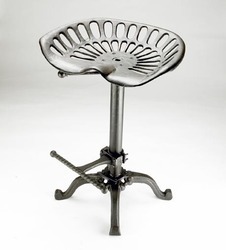 The stools ship fully assembled, allowing you to immediately put them to use for your next social gathering at your kitchen counter or home bar. 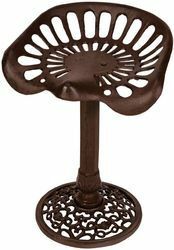 The convenient height and well-placed footrest of this rustic stool make it a perfect fit for any kitchen recreation room with an outdoors feel. 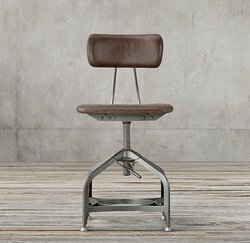 The seat and back rest are made of pinewood, adding durability and strength to this metal and wood bar stool, while the distressed finish supports an industrial vibe. 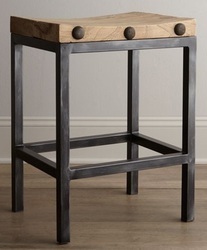 This stool is the perfect addition to a kitchen island where family and guests need extra seating. 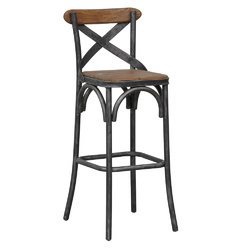 Use it as a stylish and versatile accent to a downstairs home bar or to the pool area. Give the dining room table an upgrade by adding this simple, traditional piece. 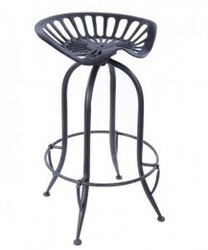 This bar stool combines beauty with purpose in any room of the home. This industrial factory stool from the Dependable Manufacturing Co. has it all: a fully adjustable frame (that even brings the foot rest when it raises and lowers), great worn green patina and a beautiful solid oak seat. 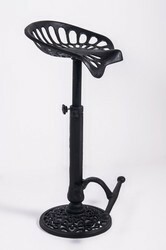 We love the triangular base and the adjustable height allows this stool to go from counter height to bar height in moments. Trends in the furniture industry changes very much like the fashion industry. Materials, themes and pieces that are a fad these days, could be outdated soon. People's tastes are changing constantly and newer types of furniture are finding their place in the market. Over the last few years, metal furniture has made inroads in the lives of people. Gray and white metal furniture or brass furniture are being increasingly spotted in households and offices. While the initial acceptance was reluctant, metal furniture slowly began to make inroads in the furniture market. This was partly because of the fact that governments all over the world had imposed strict restriction on tree felling and the use of wood. 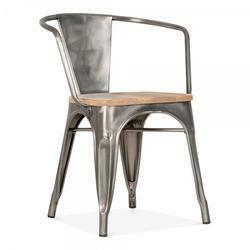 Kraft Tree have some wonderful pieces of metal furniture in its repertoire. They are surely to suffice the needs of all furniture aficionados. Our furniture gives your home a tasteful, contemporary and attractive look. Everything that you wanted from dining chairs and tables to kitchen cabinets and children's furniture can be availed of us. 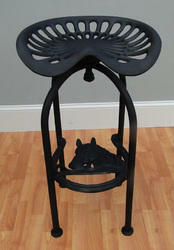 Our basic iron and wrought iron furniture have become immensely popular. They reflect a nice blend of contemporary and traditional styles that gives an appealing look to your living space. 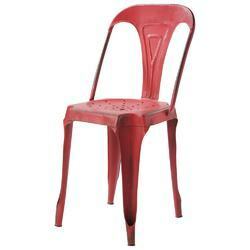 Our range of metal furniture exudes aristocracy.